After joining Cool Silicon e.V. 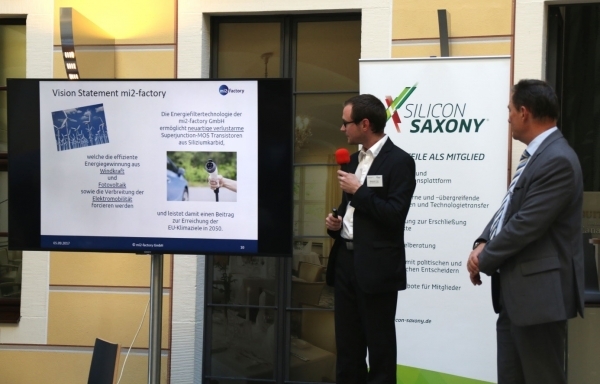 in the beginning of this year we decided to become a member of Silicon Saxony e.V. also. This is a perfect platform for us to get in contact with other players of the semiconductor branch and to have a strong voice together. Furthermore Silicon Saxony fills our calendar with interesting events and gives possibility to take part e.g. in trade fairs together with other members. We are looking forward for a fruitful cooperation! Benjamin followed the invitation of Silicon Saxony to the Summer Festival 2017 at 5th September to present mi2-factory as new member within the nice atmosphere of the atrium of Westin Bellevue in Dresden near the Elbe.